Do you have a business or event aimed at Central Coast kids and families? Want them to easily find information about your services? Playing in Puddles is your perfect fit. 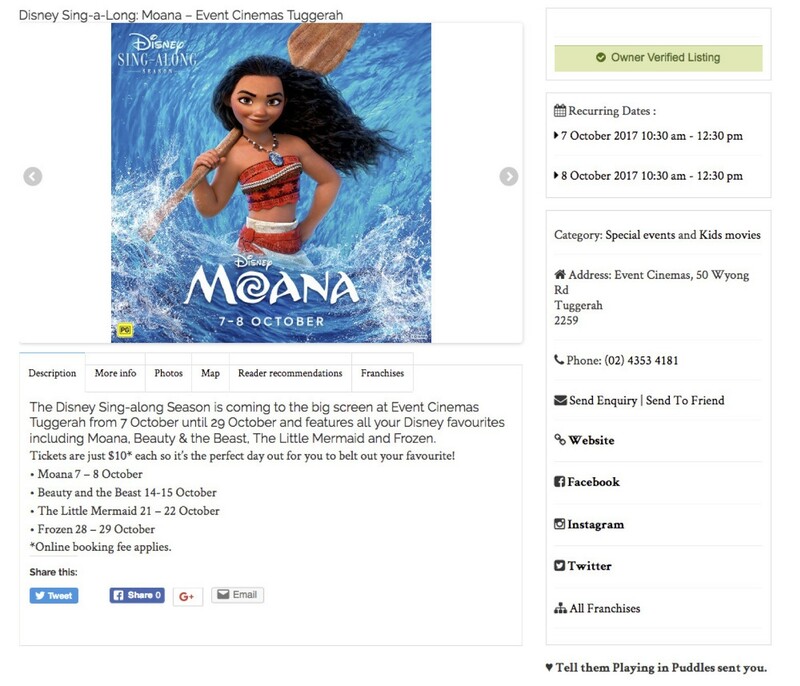 Holding a family-friendly event? Increase your event’s visibility and create maximum hype and exposure by engaging us to share it with our readers. Our media kit is available. Please email Katie Stokes on info@playinginpuddles.com.au for a copy. Want a package tailored specific to your event and event timing? Please contact Katie Stokes, editor of Playing in Puddles, to discuss what we can do for you: info@playinginpuddles.com.au. We’d love to include your event in our local Events Calendar. If you’re holding a one-off event you’re welcome to add it to our calendar for FREE. Please note that the free listing does not include any promotion on our Facebook, Instagram or newsletter. Partnering with Playing in Puddles is a cost-effective advertising option and a great way to increase your visibility to potential customers. Want a package tailored specific to your business? Please contact Katie Stokes, editor of Playing in Puddles, to discuss what we can do for you: info@playinginpuddles.com.au. Want more eyeballs on your business or event? Banner Advertising gives your business maximum exposure on Playing in Puddles’ website, which gets 29,000 hits every month. Want a package tailored specific to your service? Please contact Katie Stokes, editor of Playing in Puddles, to discuss what we can do for you: info@playinginpuddles.com.au. 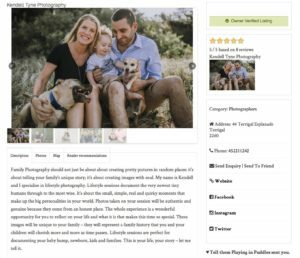 Here’s what local businesses are saying about their experience in being promoted by Playing in Puddles. “Thank you for all your help with getting our tour message out. The stats are great and we will be using your platform again.” – Kimberly Gonidellis, Lah-Lah’s Big Live Band. “Wanted to let you know how happy we are with Playing in Puddles. 9 out of 10 newbies that I ask ‘Where did you hear about us?’ answer Playing in Puddles.” – Ben Nilsson, Kincumber Indoor Sports. “We are so stoked to be partnering with you – seriously the best marketing money we have spent in the last 12 months!! You are creating a wonderful community. Since being featured on PIP we have been inundated with requests for private tours in the holidays & for vacation care centres to come to the farm. They are finding me – which is so wonderful. So many coming on tours are finding me because of you.” – Virginia Mall, Grace Springs Farm. 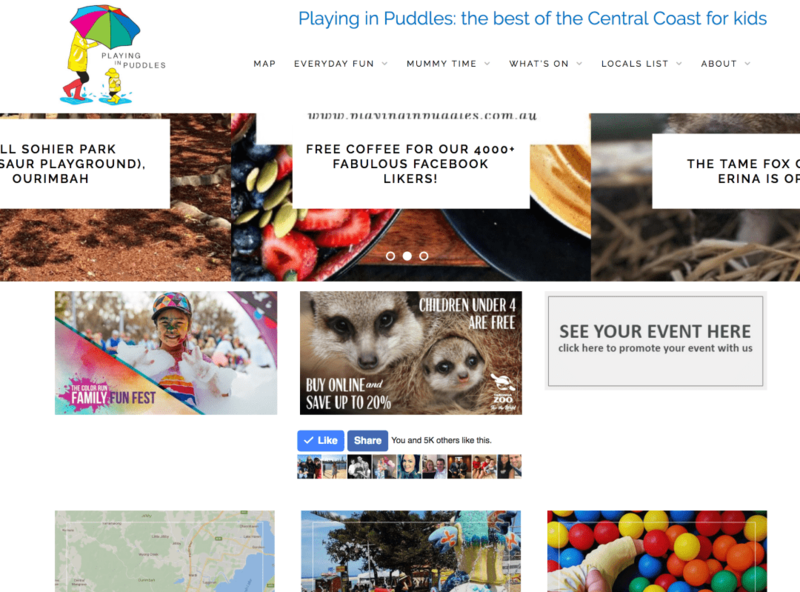 “Playing in Puddles is a great way for our business to connect with active families on the Central Coast, delivering many new families to experience our various activities and events. Playing In Puddles is now one of the top referring sources to our website.” – Nicole Hain-Lynch, Digital Marketing Coordinator, Glenworth Valley. “Since being shown on Playing in Puddles we have had a lot of enquiries and lots of new girls trying out classes. I am so happy we chose to get the word out using Playing in Puddles’ Facebook page. Money very well spent! !” – Leanne Davies, Central Coast United Physie and Dance. Sign up to our advertisers mailing list to discover how you can be promoted MORE on Playing in Puddles. Don’t worry, we won’t bombard you with emails (they’re only sent every couple of months), and as a subscriber you’ll be the first to hear about advertising specials and promotion opportunities. * Businesses are listed on the Playing in Puddles website at our discretion. Only businesses and events relevant to our readers will be considered.